As a tearful Alison Lee was being comforted by American team-mates, one of them, Brittany Lang, repeatedly told the distressed 20-year-old "it's OK, it's only a game". If only Suzann Pettersen had remembered such a maxim before sparking the Solheim Cup's 'Gimmegate' incident on the 17th green that left her playing partner Charley Hull, and Lee, in floods of tears. Who knows whether the eventual outcome of the event would have been different if, rather than claim the hole and take the lead in their fourball match, Pettersen and Hull had carried on walking to the 18th tee? What is certain is the sense of injustice the Americans felt when Europe's leading player insisted Lee's short putt for a half had not been conceded. The US were determined to rally around Lee. "When it happened to her we all kind of jumped in there and said 'we've got to change this, we've got to right a wrong'," said Stacy Lewis. "I think that's where a lot of the motivation came from." 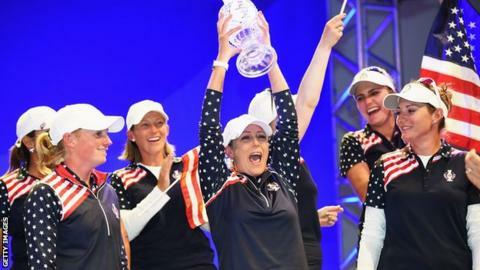 The US responded, coming from 10-6 down to record the biggest Solheim Cup singles fightback and wrest back the trophy with a 14½-13½ victory. Of course, Lee was wrong to pick up her ball without checking that the tiddler had been conceded. It might have been the shortest of putts but it was a rookie error. Suggestions that the youngster had made similar mistakes earlier in the same match were later denied by Pettersen. But would anyone want to win a hole on such a technicality? England's former European player Dame Laura Davies commented at the time: "Europe might have won the point but they lost the moral high ground." The incident galvanised the Americans and seemed to drain the spirit of a European side who had performed superbly to open their substantial lead. Golf is a game governed not only by rules but a spirit of sportsmanship. It is a sport where players call penalties on themselves and where putts have been conceded when the biggest prizes are on the line. Think back to Jack Nicklaus's concession to Tony Jacklin in 1969 with the Ryder Cup at stake. It was an eminently missable putt, more so than the one Lee would have been facing. American Nicklaus picked up Jacklin's coin to ensure the overall match ended in a tie. And yes, there were some of Nicklaus's team-mates who thought the great man had gone too far with his generosity. But, ultimately, it was a moment that portrayed golf in its best light. One player who was in that side, Billy Casper, later commented: "As time went by, we became much more appreciative of the sportsmanship displayed when he did that. "It really was one of the great things that happened in the Ryder Cup matches." The same cannot be said of the way Pettersen insisted that she and Hull had won the 17th hole in their fourball match. It meant they took a one up lead down the last, eventually winning two up. "You don't do that to your peers," said an irate American captain Juli Inkster. Europe considered giving the final hole to the US pair of Lee and Brittany Lincicome but opted not to budge. "We didn't feel that we did anything wrong - it was within the rules of golf," Europe captain Carin Koch told BBC Sport. "I found out that the putt Alison would have had on 17 was long enough where Charley and Suzann didn't feel that they would have given it. "I had to collect all the facts and I couldn't see from where I was standing how long that putt was. "We can't do anything about it. She's made a mistake and we feel bad for her but we have to follow the rules of golf." This policy was worth an extra half-point, but an expensive one given the way the aggrieved Americans responded in the singles. From a neutral perspective this astonishing US fightback is just what the Solheim Cup needed, but try telling that to the vanquished Europeans. Hull, who is only 19 remember, played wonderfully before running into Cristie Kerr, the sort of character to draw huge inspiration from the prevailing sense of injustice. Kerr had eight birdies in her 3&2 win. Melissa Reid was unbeaten in four matches, securing three wins including a singles triumph over Lang. It was a magnificent return to the European Solheim Cup team for the 28-year-old from Derbyshire. Ultimately though, Kerr and Lexi Thompson drove America to their unlikely and thrilling victory. Lang was right: it is only a game and the excitement of the comeback should take attention away from the "Gimmegate" episode which, despite Europe's protestations, left a sour taste.